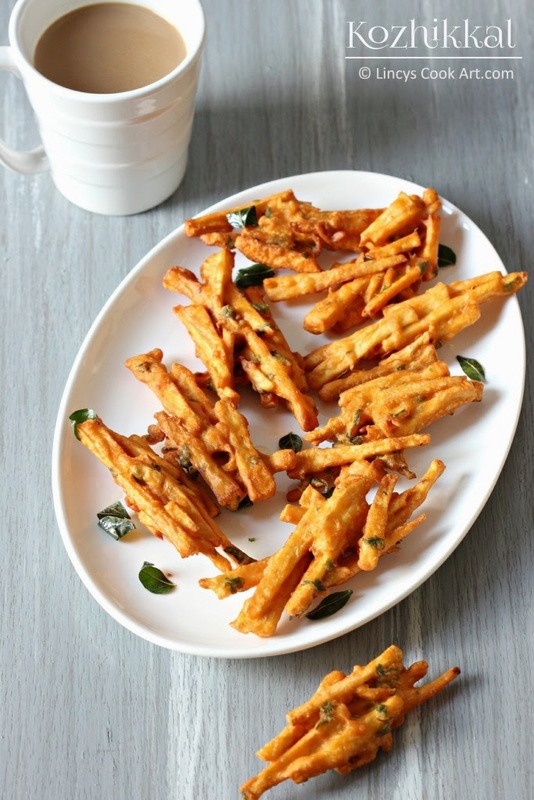 Kozhikkal or Kappa Porichathu is a Thalassery (Kerala) special tea time snack. Kozhikkal literally means 'Chicken legs'. This fried snack resembles like chicken legs so its called Kozhikkal. This is so popular in Thalassery that is Northern Kerala.These tapioca fritters are similar to bajjis but the texture is crispy on outside and soft on inside. The tapioca tastes similar to french fries. Easy to make filling snack in minutes. Some people use maida and corn flour combination to make this snack. 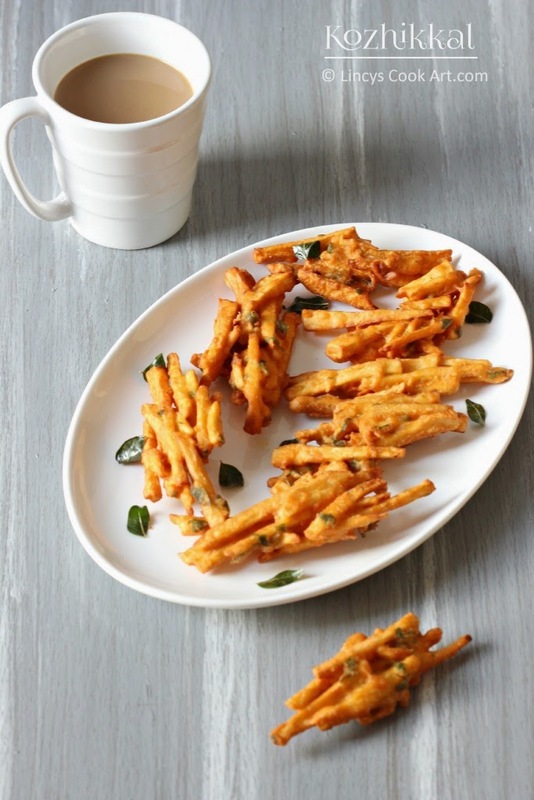 Here i have used gram flour and rice flour combo to make this tasty snack. You could use maida and cornflour combo too. Peel the tapioca and cut them in to 3 to 4 inch thin sheets. Then further slice them like thick matchsticks. In a deep bow add the gram flour, rice flour, asafetida, turmeric powder, chilli powder, ginger garlic paste, chopped green chillies, Jeera, coriander leaves, curry leaves and salt. Dry mix every thing and add some salt and mix well to form a slightly runny batter than a bajji batter. Dip them in the prepared batter and allow to coat well. Heat oil in a pan, once it is hot reduce the flame to low and start frying them. Take a hand full of tapioca sticks and slightly shake off the excess batter. Put the sticks sticking together by batter inside the hot oil and fry till the outside becomes crispy and the inside get cooked well on slow flame. Interesting snack recipe with kappa ...Lovely presentation ! Great recipe lincy.Love this snack.